The end of a month has arrived and we like to say Goodbye to November 2018. November is always 'the big one' when it comes down to the weather. It's the month with most rain in the year with a hefty rainy season at times. This year it has been a fairly mild November though. Yes, we had a couple of days with hard rain. With the accompanying flash floods. But we also had lovely sunny weather and blue skies and partially blue skies. For a November, the 2018 has been very nice, with no real day or week long rains. It has been a toss up between most rainy and sunny days. I think they balanced each other out this November. Goodbye to November 2018; Bang Rak beach road during a landing at Samui airport. Just a two months ago, but with similar weather as this November. Maximum temperature reached 34C but we also had a few isolated days where the Celsius didn't reach 30C and just stayed a few degrees below 30C. The minimum temperature was 24C but the humidity was very high, some days reaching 100%! 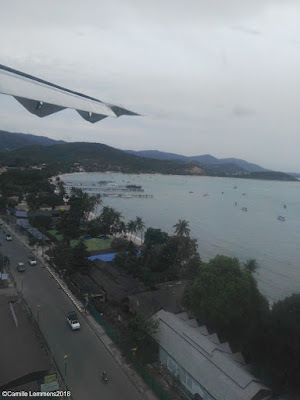 The conclusion is that this November 2018 was a nice and mild November version for Koh Samui! Let's look forward to go into December and hopefully we can carry this relatively mild November weather all the way through December.